What a beautiful potato, yes?! When I opened my CSA box last week, I was transported to the kitchen of Chopped on The Food Network. I have seen them used in that kitchen but have never eaten them. I couldn't wait to try them! My husband suggested roasting them with garlic and rosemary. Why that sounded like a great idea! 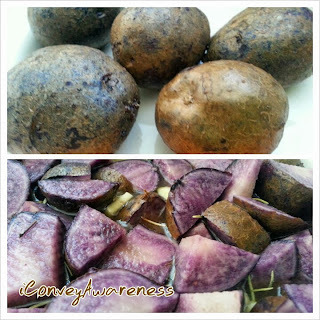 Purple potatoes are antioxidant rich and guess what? When you close your eyes and take a bite, they taste exactly like a Russet potato! I recommend eating potatoes that haven't been grown using pesticides. Potatoes are on the EWGs Dirty Dozen list. However, I know not every family can afford to buy 100% organic produce. The benefits of eating fruits and vegetables grown in any way outweigh the risks of not eating any produce. When you're able to make different food purchases, aim for buying organic produce that falls on the annual publication of the Dirty Dozen. They have found up to 35 varieties of pesticides on potatoes. Preheat oven to 420 degrees F. Cut potatoes into 1 inch cubes (similar sizes) for even roasting and add to a Corning Ware dish. Salt the potatoes and toss them for even coating. Pour the vegetable broth over the potatoes. Sprinkle the rosemary and garlic onto the potatoes. Roast for 20 minutes without the lid. Toss (using a long handled spoon carefully toss them while in the oven) and continue roasting for another 20 minutes with the lid on. Check the texture of the potatoes. I roasted mine for 45 minutes. Many years ago I moved away from table salt to sea salt then I was introduced to Himalayan Sea Salt about two years ago. I know the benefits of the pink salt outweigh the benefits of sea salt but I'm not always consistent but what I can tell you though is the only table salt you'll find in my house is for use in my son's crafts. You can find iodine in cow's milk (if they've eaten iodine rich foods while grazing) and in seafood (you can supplement with Cod Liver Oil (I recommend Nordic Naturals - I'm an affiliate as a Certified Health Coach)). If you like sea vegetables, kelp is an exceptional choice for iodine. Also some processed foods have added iodine. Have you eaten purple potatoes? If so, how did you prepare them? Feel free to leave a comment with your recipe. Maybe I'll try yours out and share it in a future blog post!